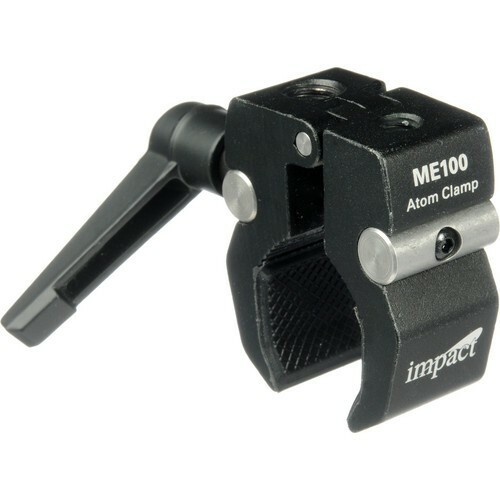 The Impact Atom Clamp is a smaller version of the popular Impact Super Clamp. Weighing in at a mere 4.0 oz, the Atom Clamp can support a load of over 15 lb. This, and the fact that it comes with 1/4"-20 and 3/8" female sockets, makes it ideal for use with most standard camera and grip accessories. It's ideal for small sets or tabletop photography. The Atom Clamp is made of lightweight aluminum and features a textured, non-slip jaw grip that is optimized to work with poles or flat objects. Light and compact enough to carry around in your jacket pocket or camera bag. Box Dimensions (LxWxH) 5.5 x 3.2 x 1.5"
Versitile little clamp that easily attaches to round and rectangular surfaces. Ratchet handle allows for use in tight spaces. Male to male 1/4" adapter screw made it easy to hold my 7" field monitor in place. It's built rock solid -metal with rubber grips- I'm looking forward to picking up a few more in the coming weeks! Will definitly recommend to my friends.